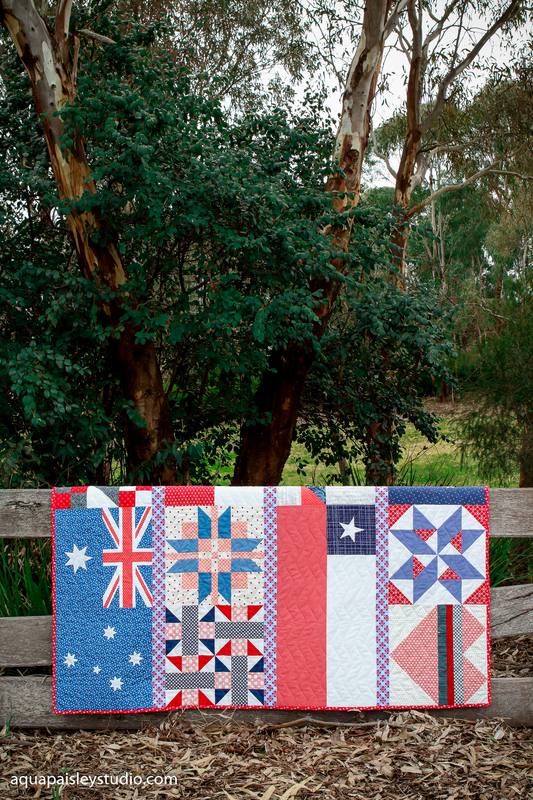 This Pieces of Home quilt (yes, quilty pun intended ;), is one I made for my brother and his family. They currently live in Santiago, on a 3 year assignment. 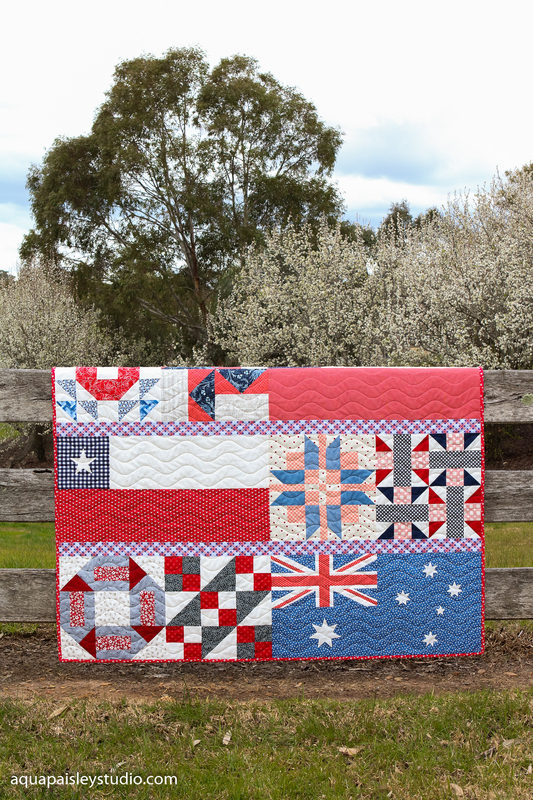 When my parents told me they were planning a visit to Chile, I went to work piecing this quilt for them to deliver in person. If you have been following my quilting adventures for a while then you may have seen the quilt I made for my son to take with him on his Johannesburg adventure. I shared my progress on Instagram under #piecesofaustraliaquilt. This was one of those projects were the moment the quilt was labelled, it was packed in a suitcase and crossing an ocean – so I only have this one quick snapshot of the finished quilt. Making Jacob’s quilt was entirely a matter of heart. I didn’t have a plan when I started. I knew I wanted him to have a piece of home while he was away from home, and so his quilt design began with a single flag. One flag grew into two, and then four. I considered making 8 flags, but the hand-stitching involved in the appliqued stars was time consuming, and I was running out of time! So, a sampler quilt was born. 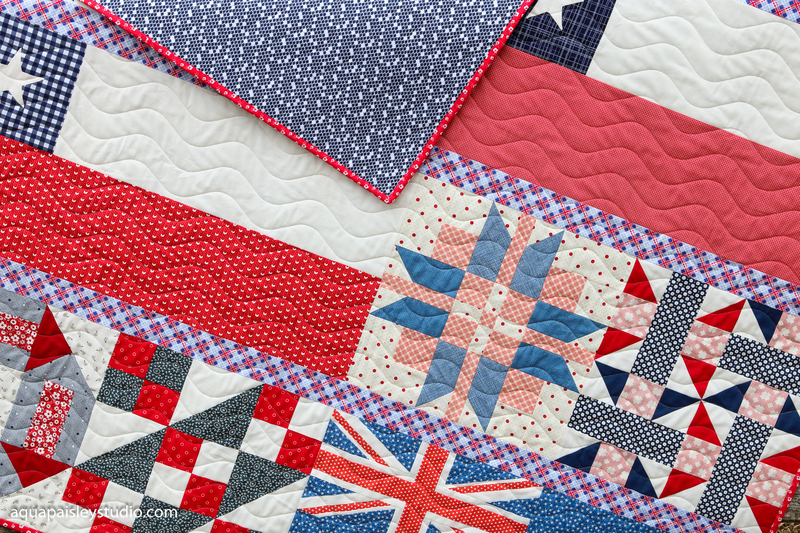 I think it was a little bit of quilting serendipity! Same, Same – But Different! 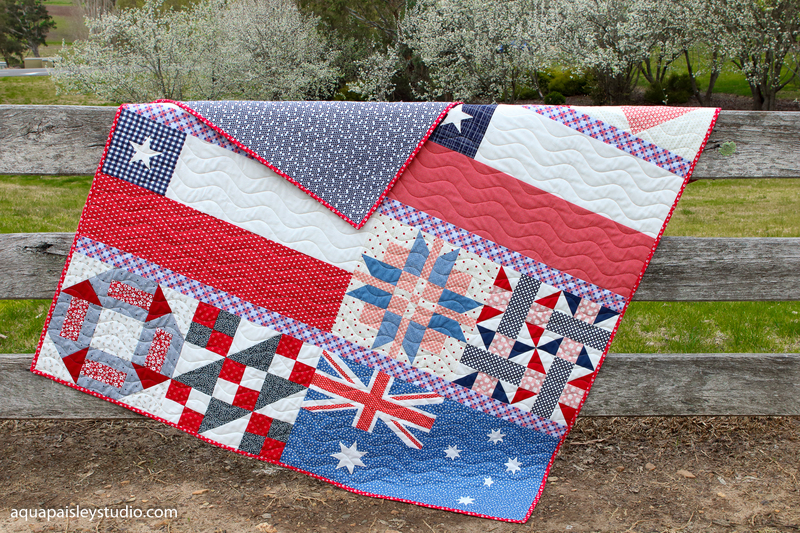 As a mother, Jacob’s quilt couldn’t have been more perfect, but as a designer there was one tiny thing that bothered me! 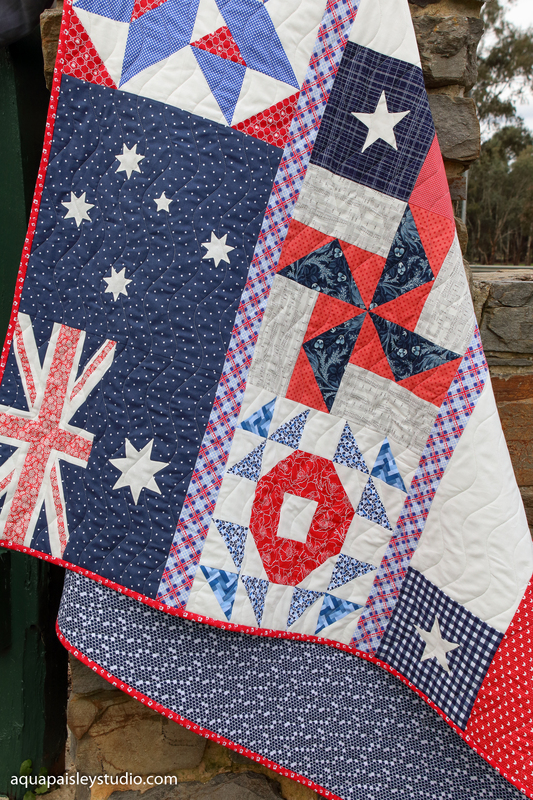 If you look closely at the Union Jack portion of the Australian flag you may notice that it doesn’t align nicely with the block above. That’s because the proportions are ever so slightly wrong. It was a little technical error that I was able to rectify making this quilt for my brother’s family. It was a small creative victory, but one that made me happy ;). 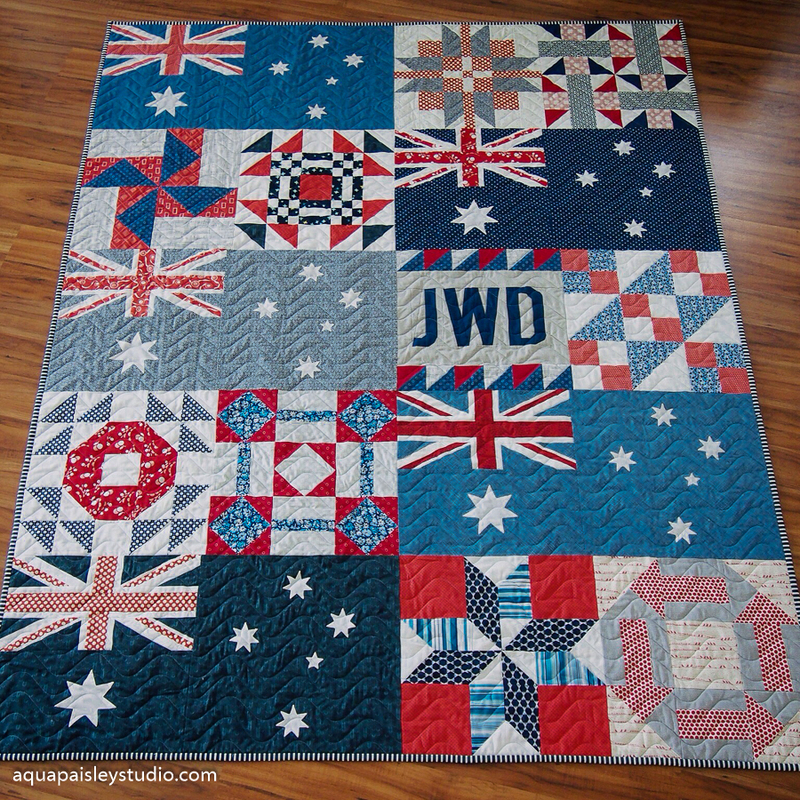 After my technical conquest with the flag proportions, I primarily followed the same sampler formula I had used when making Jacob’s quilt, but with a few minor variations. This quilt was made up of 4 rows instead of 5. I decided to make it a little smaller because it was more likely to be used as a lap quilt rather than a bed quilt. When I made Jacob’s quilt, there was interest in a pattern, and this idea was in the back of my mind when making this one. I took lots of notes as I pieced the blocks together so that one day the pattern might become a reality. While contemplating writing the pattern though, I thought that I should include a number of different flags to make the pattern more universally appealing. But, one of my biggest hurdles has been the variation between flags, and how this impacts the overall design. Consequently there are still a few more design hurdles to leap before I can move this idea from my mind onto paper ;). Including the Chilean flag meant that suddenly I now had to address the issue of the top white portion of the flag blending into the background of the surrounding blocks. If I had put more forethought into this, I could have used darker backgrounds for the surrounding blocks, but you know what they say about hindsight ;)!! After lots of pondering, I felt it was important that the flags were clear and distinct. The solution was to include horizontal sashing strips to create a strong division. In the end I am happy to say that despite some bumps along the way, the many pieces of this puzzle came together to make this Pieces of Home quilt truly special. Piecing both of these quilts reminded me that it’s important to let go of any preconceived idea of what a quilt might look like and instead follow my instincts and let my heart guide my stitches. It’s a good reminder for everyone – sometimes you have to change a ‘pattern’ to make it work for you, and there’s nothing wrong with that – that’s creativity in action!! I am still aiming to write a pattern for this quilt, but I have to admit that since it is not as straightforward as most, I keep pushing it to the bottom of the to-do list! The good news is, lately I have been powering through my to-do list, making it more and more likely that I will be able to focus on writing the pattern during the Summer / New Year period. (fingers crossed)!! 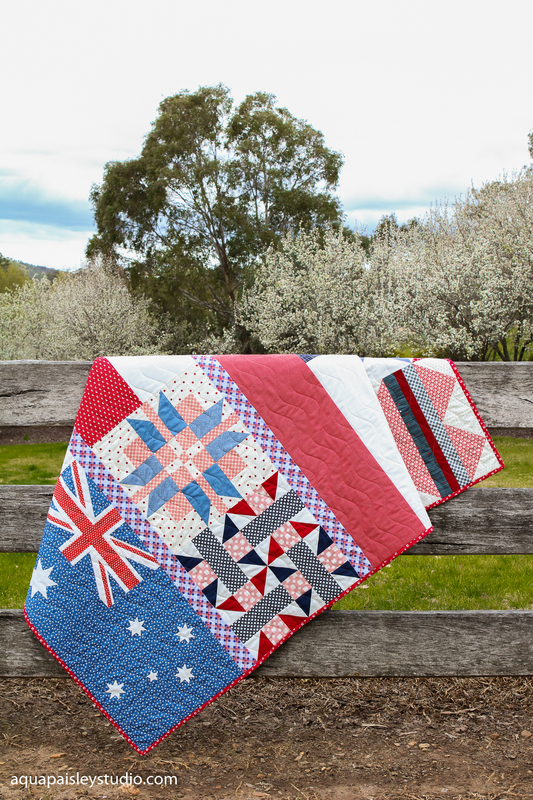 Do you have a favourite quilt that reminds you of home? What do you love most about it? Subscribe to my newsletter to get updates on all the latest product releases, sales, and some free goodies from time to time! Both of them are absolutely gorgeous!! 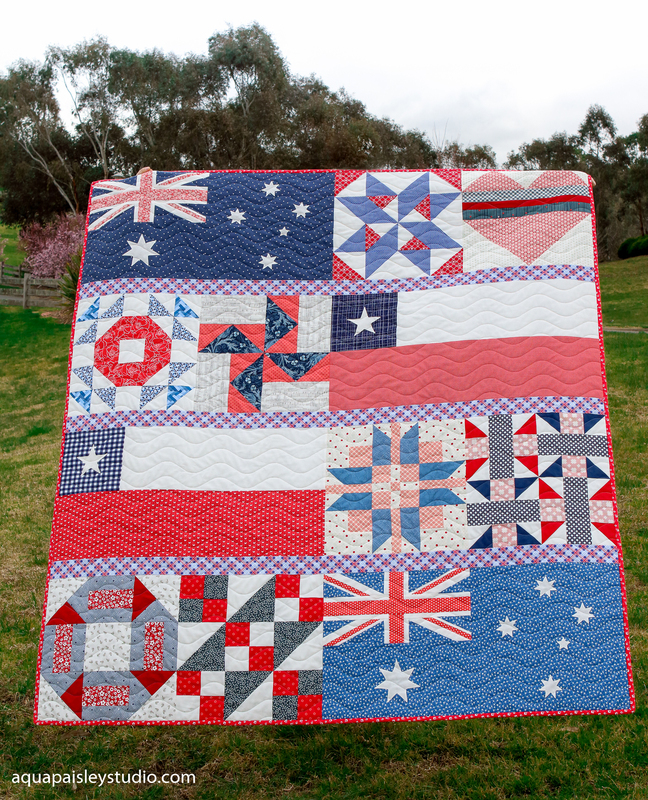 Beautiful job with all the red white and blue fabrics for each of the blocks and designs. What keepsakes! Quilts are so much more than pieces of pretty fabric and thread. They are a tangible part of our life story, and a creative expression of who we are. They can showcase everything from our favourite colours to things we value and our hopes and dreams. Every quilt has its own story. Stay up to date on all the latest studio news, including pattern releases, sales, and motivational thoughts straight into your inbox! All the creative images you see featured on this site are the intellectual property of Aqua Paisley Studio unless noted otherwise, and are protected under copyright law. If you want to share my images for the purpose of inspiration please provide the appropriate credit and link back to this website. Please do not share any commercial content such as patterns or tutorials without express permission. Welcome to Aqua Paisley Studio! 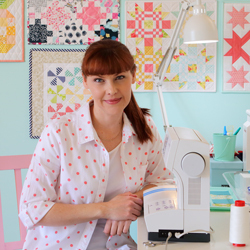 Aqua Paisley Studio is dedicated to the language of quiltmaking and 'the story behind the quilt'.